A Marine Corps aviator, Glenn was one of the seven original Mercury astronauts and the first American to orbit the earth (February 20, 1962). 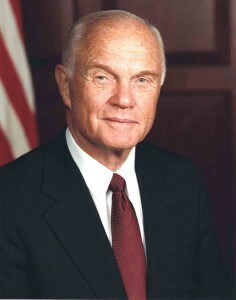 Glenn was elected to the U.S. Senate from Ohio in 1974 and was reelected three times. At 77, on October 29, 1998, he returned to space as a “payload specialist” aboard the shuttle Discovery, thereby becoming the oldest person ever to travel in space.